Lavender gently refreshes, stimulating follicles and circulation. Biotin B-complex infuses essential protein for thicker, fuller strands, improved strength, texture, and manageability for maximum volume and silky sheen. Made naturally without GMO’s, gluten, paraben preservatives, petrochemicals, phthalates, sulfates, synthetic colors, dyes and fragrances. This conditioner is by far the best product I have found for my very fine hair. I've tried a lot of different brands and non of them have given me the volume and body that Andalou Lavender and Biotin conditioner gives me.. Next time I order it I will buy the shampoo also. Wonderful product. I bought this with the shampoo and the spray and it is fantastic. I have very thin, fine hair and now I have bouncy hair with a shine, how they have pulled that off I don't know. Normally something that makes your healthy and shiny makes my hair flat as a pancake but not these products. So impressed. Better than any chemical volumising product that I used before moving to natural products. Wish I found this years ago. This is the first conditioner I actually use everytime I wash my hair. Doesn't weigh it down or leave it feeling greasy, just nicely moisturized. I wanted to love this shampoo and conditioner combo so badly but Iâ€™m left strongly disliking it. I have had great results with other Andalou products so when I wasn't getting good results (really greasy hair and unpleasant smell) within the first few days I was discouraged. It is almost a month later and nothing has changed. I have tried everything from not using the conditioner at all to taking 10 minutes to rinse every speck of product out. On one occasion, I even showered twice in a row and still emerged with greasy hair! I hadnâ€™t had problems with greasy hair until using these products. I DO NOT recommend. An excellent conditioner. Smells amazing and doesn't weigh down fine hair. Leaves your hair feeling very soft and healthy. 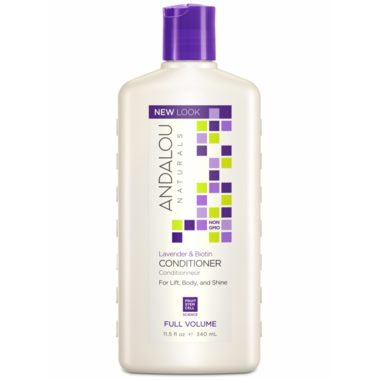 The Andalou Naturals Full Volume conditioner working in concert with the Andalou Naturals Lavender & Biotin Full Volume Shampoo gives my hair volume and makes it more manageable to style. This is a great conditioner! Both my husband and I use it. It leaves my hair so soft that my husband keeps reaching out to touch it. The smell is light and doesn't stay in my hair once it's been rinsed out. This conditioner doesn't feel as slippery/slimy as other brands. You can work it into your hair and then rinse it all out. It's expensive but worthwhile! Like the shampoo, this conditioner has a real lavender scent. It is not greasy and leaves hair feeling lighter than most conditioners. Hair is easy to comb through. Will buy it regularly. I am of Asian ancestry and tend to have oily, limp hair. This conditioner is perfect - my hair feels shiny, but doesn't weigh it down. It's gentle enough that I use it and the shampoo on my little girls, in a pinch. I didn't really see any difference in my hair, after using this product. Thank god I use a moisturizing shampoo! I don't recommend it. I really like this Conditioner, made my hair feel soft and thicker, I used it with the Shampoo, the scent is nice. I would order this product again.